I’ve been wanting to try out this pie for a while now, ever since Christmas, but Harry and David was completely sold out of it until a week after New Years! I first heard about this pie from a coworker, who mentioned that it was one of Oprah’s favorite things. 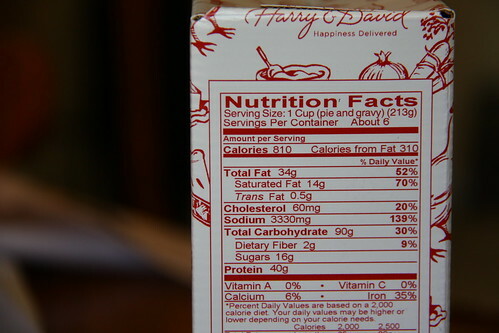 I checked it out on the Harry and David website and I was very intrigued because it was just crust, gravy and chunks of chicken – no veggies AT ALL! After an hour and half, we were ready to eat! As you can see, they do not skimp on the chicken. 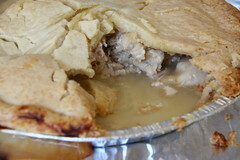 The flaky, buttery crust reminded me of Ritz crackers and the gravy was rich, creamy and flavorful. If the pie wasn’t so unhealthy and pricey ($20 each + shipping, unless you buy in store), I would probably eat it more often. 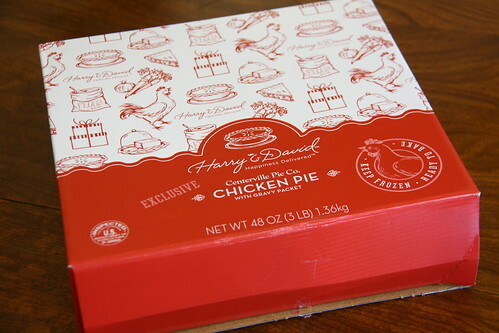 Henry thought the pie was too plain, as did some of the Harry & David reviewers, so this pie is not for everybody. If you’re interested, you can order online here and here. 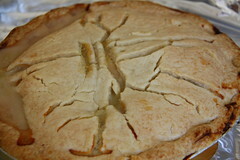 This entry was posted in this girl cooks and tagged chicken pie, harry and david, oprah. Bookmark the permalink.